10.51 this morning and the house started to move again. The first p-wave came through as a sudden jolt followed by the s-wave, the slow rolling tremor that causes the real damage. Fortunately it wasn't too strong but at about thirty seconds it was obvious somewhere wasn't having a good time. Checking the earthquake App on my phone I can see the epicentre was just off the coast of Fukushima. Again. The earthquake of March 11, 2011 was a little further north than Fukushima but close enough to change the way the world sees nuclear power. And then the aftershocks continued to pound the coastline over the next few months, slowly reducing in frequency but not actually coming to a final halt. Today's quake was a M5.4, not large by Japan standards but enough to rattle Tokyo some 300km away. 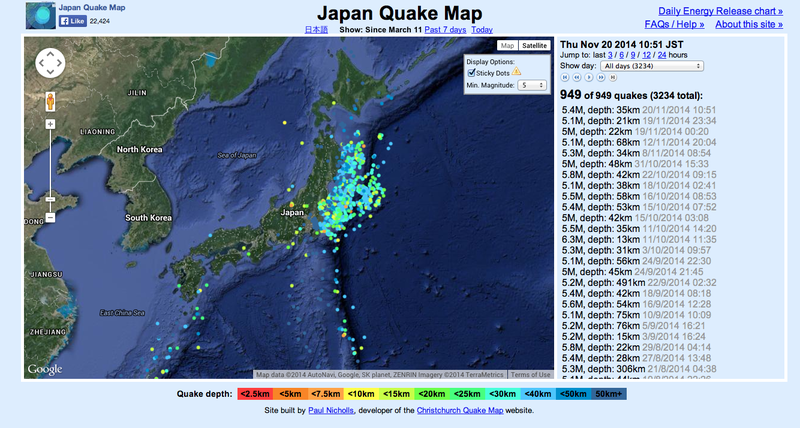 The map below doesn't show all the earthquakes to hit Japan post 3/11. It only shows the 949 we've experienced over M5.0. In all there have been over 3,000 since the main quake. And on the Tohoku coastline, just about dead centre in the area covered with dots, is the Fukushima Daiichi Nuclear Power Station. Much closer to the action, they won't have been having a good morning.